It’s no secret that San Francisco residents are pissed about Super Bowl 50 invading their city. But now they can take that piss public with the city’s first open-air urinal, where you can pee freely, starting today. San Francisco has been battling its public urination problem for years, recently resorting to using hydrophobic paint on some walls frequented by local pee streams. It’s so bad that corrosion from urine caused a streetlamp to fall over last year, launching full safety inspection of all city infrastructure. But people just keep on peeing everywhere. So now, a better solution seems to be encouraging all that urine to be splashed in special receptacles. 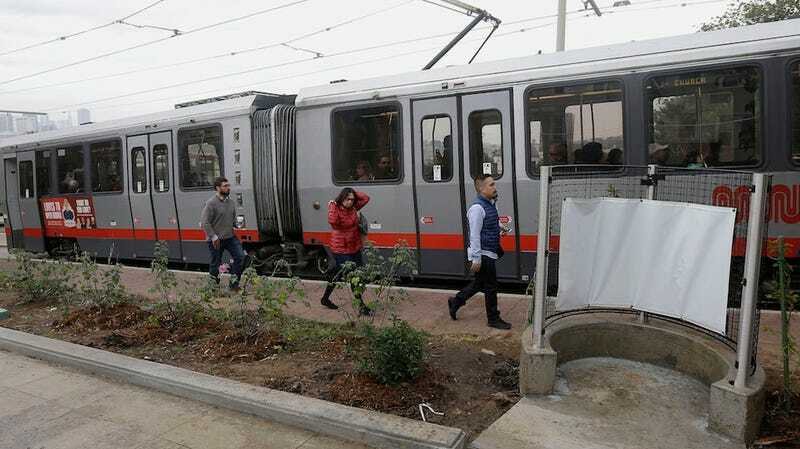 An open-air urinal has been installed in the city’s Dolores Park, where San Francisco residents are welcomed to drop trou and relieve themselves right there, with a lovely view of passing MUNI trains. Public urinals are not an unusual sight in some cities; you’ll spot them in many European towns where residents like to drink beer. But I’m curious why San Francisco didn’t use a very thoughtful and well-designed local proposal that turns urine into fertilizer for street trees. I guess this was probably cheaper. Frisco: Ready to Go Pee Anywhere™.